I don’t often like to go back and re-read books…and I consider this a fault, more than a strength. But sheesh, there are just so many I want to read. But I do have a list of books that I have intentions to get back to. Either because they were really good and deserved further thought even years later. Or because I wonder how much more I could get out of them in a new season of life. The Prophetic Imagination has long been a stand out for me, and it was as valuable last month as it was 8 years ago. (And why, oh why, don’t I have any notes from my first reading of it in my blog archives?) There may not be many books I can compel myself to read again, but I’m glad this was one of them. Quite possibly, in all my years of preaching and Bible teaching, my first reference to the Holy Hand Grenade of Antioch. Some meaningful and life important stuff to be found in here too, of course. A sermon recycled from Mustard Seed for our friends at Vox Veniae. This one has stuck with me in mind, practice and other conversations, ever since I preached it for Austin Mustard Seed. I was glad to be able to have another go at it for my friends at Vox. Welp, I’m lagging to posting books I finished two months ago. And yes this is also a book pulled from the Best of 2017 lists. Other than that, had no idea what I was getting myself into. But I was yanked in hard with the opening chapter. One of the things I appreciate about literary fiction, if written well, is that I feel like it helps me identify with people who have a very different life experience than mine. That’s the case here. Hard to read at times, but of course that’s also an invitation to identify with and root for the characters. We have seen how people describe the common characteristics of optimal experience: a sense that one’s skills are adequate to cope with the challenges at hand, in a goal-directed, rule-bound action system that provides clear clues as to how well one is performing. Concentration is so intense that there is no attention left over to think about anything irrelevant, or to worry about problems. Self-consciousness disappears, and the sense of time becomes distorted. An activity that produces such experiences is so gratifying that people are willing to do it for its own sake, with little concern for what they will get out of it, even when it is difficult, or dangerous. Been aware of this book for a quite a long time, and finally reading it. That paragraph above describes an elusive way of working that I get to once or twice a week, but always hope for more of. Read this one with two of my kids after we culled it from a history reading list for homeschooling by Susan Wise Bauer. The book offers helpful historical context for first century Galilee and the tensions between Jewish hopes and Roman oppression. The book is 50 years old — reminding me that much of this history was around but lost to me in my own childhood and early theological learnings. Glad to be able to remedy that with my own kids. As we were preparing to go through Acts, I saw a respected friend had this in his Goodreads updates. We were preparing to through Acts this summer, and I thought it would be helpful to read something besides commentaries. It’s also thoughtfully charismatic and evangelical in a way that is outside my normal theological stream, or at least my more recent theological stream. I needed that push in some other directions, and I hope our church community is benefiting from it. 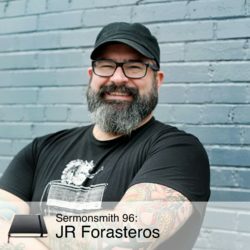 Like so many Sermonsmith interviews, I could help but get caught up in JR’s energy and passion. And like so many, I’m left hoping for a chance to meet in person someday. Maybe this one we can pull of since he’s only a couple of hours away! It had been a few weeks away from preaching, so it felt good to be back in the swing. I think this one came out as a coherent string of thoughts that moved from Anthony Bourdain to an ancient Pharisee rabble rouser to thoughts from a Sri Lankan theologian to a Congolese refugee pastor. And quite a few other ideas in the in betweens. Another book plucked off the many Best of 2017 lists that I finally got to a few months in to 2018. Intriguing and timely concept as magical doors appear throughout the world allowing refugees to leave one area and move to another. (I don’t think I’m giving too much away there.) But while the overall concept and storyline were interesting, the book lacked the level of character depth I typically prefer. So, in the end, I wasn’t left wanting to spend more time with them or know what happened next for them. Some really good, and some really helpful, ideas in this one. The overall concept of focusing on 12 weeks at a time for goals and marking progress makes a lot of sense compared to the long arc of 12 months. I’ve been trying to implement the timeframe for development of one of my side projects. Much like my experience with Getting Things Done (15 years ago! ), I’d guess I will get more benefit and value from a second reading after I’ve engaged with the overall concept for a while. The formation of an alternative community with an alternative consciousness is so that the dominant community may be criticized and finally dismantled. But more than dismantling, the purpose of the alternative community is to enable a new human beginning to be made. The fact is important enough to bear repeating: people organize their brains with conversation. If they don’t have anyone to tell their story to, they lose their minds. Like hoarders, they cannot unclutter themselves. The input of the community is required for the integrity of the individual psyche. To put it another way: it takes a village to organize a mind. File this away in my growing (and hopefully apparent) list of reasons why true conversation should never be replaced by digital interactions. To audiobook or not audiobook. Here’s a good example of why this question haunts me. I can’t get through all the books I want to read, and audiobooks help me find space to add 5-6 books a year to my reading list. I’ve figured out that the kind of audiobooks that work best for me are narrative based, like history or biographies, or practical idea based, like this one. But the segmented nature of how I listen to audiobooks, and pay attention to audiobooks, oft makes me feel like I miss some of the big picture. I chugged through this one in many trips to meetings, dance classes and appointments. I pulled away lots of interesting ideas about the value of naps, when it’s best to drink coffee, and why my current decade of life (my 40s) might be my least fulfilling. But I’m sure there were other great ideas that floated past my head and settled somewhere in the back of my car, never to be found again. Maybe there should be a supplemental chapter on when it’s best to listen to audiobooks. I’m intrigued enough to still have this on my list of books I hope to read ‘normally’ someday. But golly it’s a long list. After 95 interviews, it’s not often that someone brings something that feels very new to the conversation. Pastor Steph did with her fantastic document called The Homiletical Oath which can be found in the show notes. Of course, she had plenty of other great things to say too, and her passion was contagious. HBO’s take on Fahrenheit 451: Good source material. Great cast. Awful movie. This summer, aMS is working our way through some of the primary story of the New Testament book of Acts. As we look at what happened in each city, we’re asking “What happens when the Holy Spirit leads the way?” Acts 7 kind of a sermon itself, so a sermon about a sermon was pretty meta. This feels like an important and timely book filled with important and timely ideas. The topic of attention is one that has, um, had my attention lately. I’m aware how much I have to work harder to stay focused on a particular idea or task. I’m aware how much that this same struggle for attention is part of a broader conversation in our culture. And in a twist of irony, I’m aware of how interested I was in reading this book. And how much I struggled to stay engaged through the whole of it. A.J. 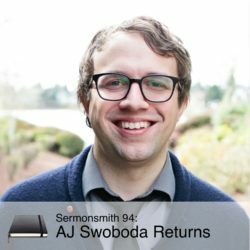 was one of my first guests on Sermonsmith, and it was a treat to have him return. 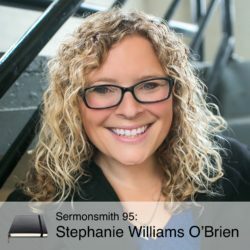 This time, we focused more on his new book, Subversive Sabbath, and the role of rest and Sabbath keeping in the rhythms of sermon prep. A.J. Jacobs is one of my guilty pleasures, and I’ll read anything he publishes. He makes me laugh, often. I suppose it doesn’t need to be all that guilty though, because there is thoughtful engagement weaved in with the humor. This wouldn’t be the first one I’d recommend to someone new to his books, if only because I didn’t find the subject matter as interesting. No regrets for the time I spent reading it, though.